India and Japan signed 15 agreements on 14th-Sep-2017 to broad-base their strategic partnership and agreed to strengthen cooperation in the Indo-Pacific region. India and Japan have signed 15 agreements for enhancing bilateral cooperation in several key areas including investment promotion, civil aviation, and science and technology. The agreements were signed in presence of Prime Minister Narendra Modi and his Japanese counterpart Shinzo Abe after 12th annual summit talks in Gandhinagar, Gujarat. The MoUs being strategic in nature, no investment figures were revealed by either side for the agreements. Prime Minister Narendra Modi with his Japanese counterpart Shinzo Abe ahead of India- Japan annual summit at Mahatma Mandir, in Gandhinagar on 14th-Sep-2017. 1. MOC between the Ministry of Home Affairs of the Government of the Republic of India and the Cabinet Office of the Government of Japan aims to cooperate and collaborate in the field of disaster risk reduction and to share the experiences, knowledge and policies on disaster prevention. 2. MoC in the field of Japanese language education in India between MEA and MOFA, Japan, to further strengthen bilateral relations and cooperation in the field of Japanese language education in India. 3. The India Japan Act East Forum to enhance connectivity and promote developmental projects in the northeastern region of India in an efficient and effective manner. 4. Arrangement between India Post and Japan Post on administrative instruction for the implementation of cool EMS service aims at implementing the commercial arrangement of ‘Cool EMS’ service between Japan Post and India Post, through which fresh food can be sent from Japan to India in cool boxes for the Japanese expatriates in India. 5. The India-Japan Investment Promotion Road map between DIPP and METI to facilitate and accelerate Japanese investments in India. 6. MoC between METI and the state of Gujarat on ‘Japan-India special programme for Make In India’ in Mandal Bechraj-Khoraj, to cooperate in infrastructure development programmes in the Mandal Bechraj-Khorajregion. 7. Exchange of RoD on Civil Aviation Cooperation, which opens skies between India and Japan i.e. Indian and Japanese carriers can mount now unlimited flights to select cities. 8. Agreement for international joint exchange programme between inter-disciplinary theoretical and mathematical sciences programme (iTHEMS), RIKEN and National Centres for Biological Sciences (Simons-NCBS) to establish a ‘Joint Exchange Programme’ to identify and foster talented young scientists from both countries to collaborate in the field of theoretical biology. 9. Joint research contract between the National Institute of Advanced Industrial Science & Technology (AIST), Japan, and the Department of Biotechnology (DBT) to conduct joint research and to establish an international centre named ‘DBT-AIST International CENter for Translational & Environmental Research (DAICENTER)’ at AIST, Japan, in order to promote science and technology in both. 10. MoU signed between DBT and National Institute of Advanced Science & Technology (AIST), to promote research collaboration between DBT research institutes and AIST in the fields of life sciences and biotechnology. 11. MoU signed on international academic and sports exchange between Lakshmibai National Institute of Physical Education (LNIPE)and Nippon Sports Science University, Japan (NSSU). This will facilitate and deepen international education cooperation and exchanges between Lakshmibai National Institute of Physical Education, India, and Nippon Sport Science University, Japan. 12. MoU signed on international academic and sports exchange between the Sports Authority of India and Nippon Sports Science University, Japan (NSSU). This will facilitate and deepen international education cooperation and exchange between the Sports Authority of India and Nippon Sport Science University, Japan. 13. Letter of intent signed between Lakshmibai National Institute of Physical Education (LNIPE) and the University of Tsukuba, Japan to strengthen strategic collaboration, joint research programmes and exchanges between the Lakshmibai National Institute of Physical Education, India and University of Tsukuba, Japan will be undertaken. 14. Letter of intent signed between Sports Authority of India and University of Tsukuba, Japan to strengthen strategic collaboration, joint research programme and exchanges between University of Tsukuba, Japan and Sports Authority of India. 15. MoU signed between RIS and IDE-JETRO for promotion of cooperation in research-related activities to promote institutional cooperation between RIS and IDE-JETRO to strengthen the capacity of research and effectiveness of dissemination of research findings. 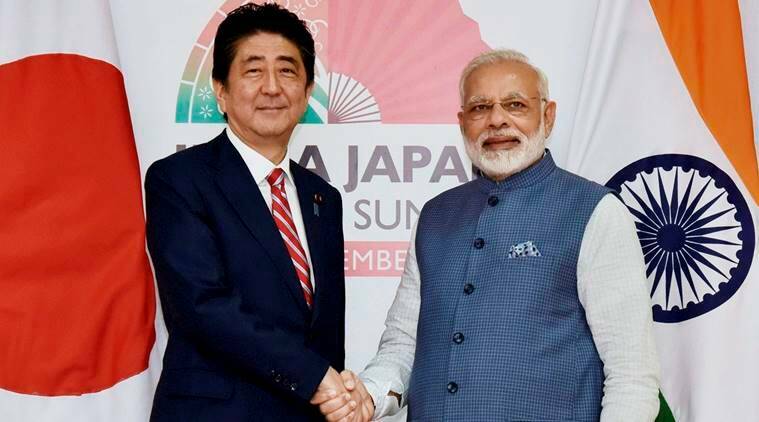 Conclusion: Prime Minister Abe thanked the Government and the people of India for their warm hospitality and extended a cordial invitation to Prime Minister Modi to visit Japan at a mutually convenient time for the next annual summit meeting. Prime Minister Modi accepted the invitation with appreciation.